A new, nonwoven cotton gauze that quickly stanches bleeding and promotes wound healing is now commercially available, thanks to the efforts of a multidisciplinary team that includes scientists with USDA’s Agricultural Research Service (ARS) in New Orleans, LA. The Agricultural Research Service is USDA’s chief scientific in-house research agency. H&H Medical Corporation – a Williamsburg, VA, firm specializing in trauma care products – rolled out the new gauze in November 2018 under the tradename “TACgauze.” The product differs from standard gauzes in that it’s made of greige (pronounced “gray”) cotton fiber – fiber which hasn’t been scoured and bleached prior to fabrication, notes Vince Edwards, a textile chemist with ARS’ Southern Regional Research Center in New Orleans. 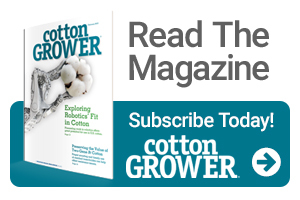 In studies there, Edwards identified the role of the cotton fiber’s outer cuticle in stimulating the body’s production of fibrin and other blood-clotting agents. To do this, he adapted the use of a micro-scale technique (thromboelastography) employed in hospitals to assess patient clotting profiles. Virginia Commonwealth University (VCU) collaborators assessed the clotting properties of fabric made from the fibers using animal models. The findings showed that when made into a gauze used to wrap or pack wounds, greige fiber performed as well as standard cotton gauze dressings. In trials, the nonwoven greige cotton gauze was 33% lighter and 63% more absorbent than standard crinkle-type gauzes made of bleached processed cotton. During the trials, the nonwoven greige cotton gauze also triggered blood clotting more quickly, shed fewer fibers and released small amounts of hydrogen peroxide, thought to help mobilize wound-healing cells at the injury site. In developing TACgauze together with the ARS-VCU team and T.J. Beall Company of Greenwood, MS, H&H sought a hemostatic gauze that was easy to carry and use, affordable, reliable, sterile, long-lasting and effective under wide-ranging circumstances – whether it be on the battlefield, accident scenes, mass-casualty events or remote locations. Interest in evaluating TACgauze has come from both the military and civilian sectors, including the U.S. Marine Corps, according to H&H President Paul Harder. Jan Suszkiw is a Public Affairs Specialist with USDA ARS in Beltsville, MD. See all author stories here.